I am thinking to have LED indicators for the TTL outputs of MAX 3232 for RX and TX indication. How much current these line drivers(TTL outputs) can source to have LED indication OR do i need to use transistor drive for the same. Thanks..
Good question, and this information isn't in the datasheet. 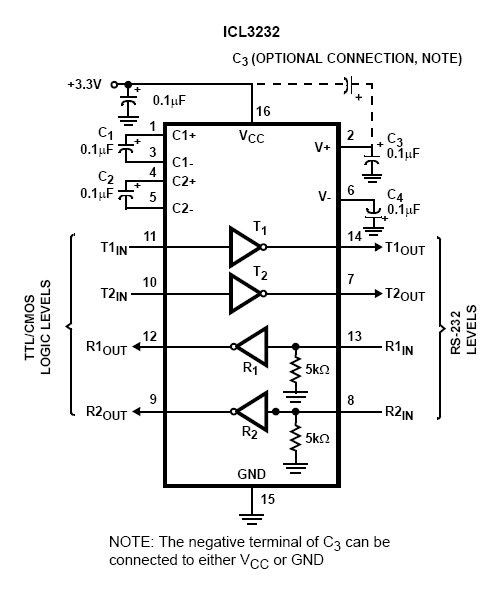 I would expect the logic side to have enough source/sink capability to directly drive high efficiency (5mA) LEDs, but transistor drive would be the safest approach (and wouldn't load down the logic to your communications port). If you try it, let us know how it works. I thought these would work with a bread board but now i see they are smd, is there any DIP versions of this ?? Who's bright ideas was it to not supply the DIP version of this and only SMD? I now have to go buy the DIP version elsewhere. The description says to attach ceramic capacitors, but the datasheet shows electrolytic capacitors. Could someone help with the wiring? 1. Will this work without a hitch in a 5V circuit? 2. 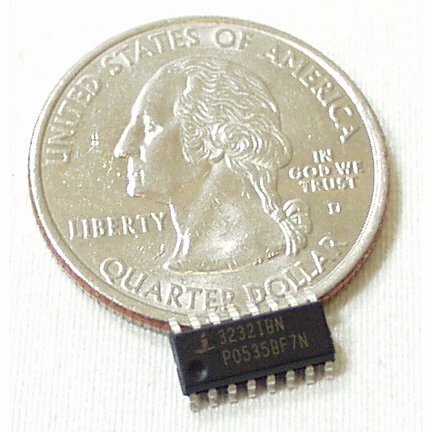 Will it serve the same function as the FTDI FT232RL that is used for serial data transmission in the Arduino Duemilanove? 3. Are the V+ and V- lines a reference voltage generated by the IC, or are they input voltages that the user has to supply? But I am not 100% sure. Can someone please clarify? 1) According to the datasheet, it should work fine at 5V. 2) No, this is a TTL to RS232 level converter. It is not a USB to TTL Serial adapter. 3) According to the datasheet (Read it! ), they connect to capacitors only. You're right, we'll add it to the next revision. I believe it's pin-compatible with the MAX232 footprint though. The part in the Eagle Library seems to be for the DIP part, not the SMD part, unless I'm missing something.